When you craft a really impeccable first film, there is a lot of pressure to provide an equally great second film. Some directors take this in their stride. Jordan Peele, for example, after winning an Academy Award for Get Out, followed up with the horrifying Us. Barry Jenkins’ crafted the superb Moonlight then his next movie was the phenomenal If Beale Street Could Talk. Some directors cannot rise to the greatness of the first film. Under the Silver Lake, a sophomore release for It Follows director David Robert Mitchell, manages to straddle both – become a perplexing film that never full rises to the occasion but doesn’t entirely sink to the bottom either. David Robert Mitchell’s neo-noir fantasy is a sharply shot and colourful film that boasts some exquisite shots and beautiful colour-grading to match its weird storyline. 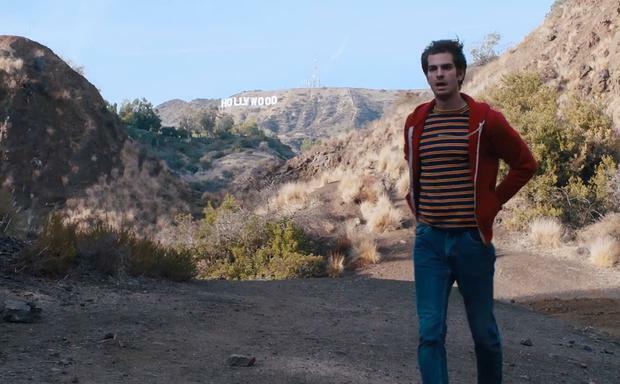 Andrew Garfield gives his best performance as an increasingly erratic loser who plunges himself into the deep seedy underworld of Hollywood and its surrounding towns. His big doe eyes lend themselves well to Sam’s curiosity and Garfield manages the humour, the fear, and the lunacy quite well. Music by Disasterpeace, though over-bearing in places, is also well-pitched in others. There’s a fear in claiming a film is nonsensical because then commenters come out of the woodwork to proclaim that one doesn’t “get it” or are “too stupid to understand.” No – on the basic level Under the Silver Lake has a pretty standard plotline – girl goes missing, secret codes, cults, and the whole she-bang. The problem is that the movie just haphazardly adds elements that don’t gel with the film or add any sustenance to the proceedings. It is so indulgent and sniffs of desperation to be edgy and quirky – never quite feeling like both. The tonal shifts and inability to decide what it is trying to be is off-putting, making it dull in places. And yet…and yet… you can’t help but find yourself drawn into this messy spider’s web. Under the Silver Lake dives into the story head-first and that’s somewhat admirable. It’s film full of contention that’ll split people down the middle on every part here. From the misogyny of our lead character and the films numerous breast shots (is that a flaw of the character or the film? ), to the weird supernatural phenomenons that crop up throughout, Under the Silver Lake will probably be discussed and chopped up for years to come . The one thing about Under the Silver Lake is that it’s era-less aesthetic, capturing a different and unusual heart of Los Angeles made me reminisce about how good The Nice Guys were. So, so good. Under the Silver Lake is in cinemas and available on MUBI now!